Caravan of Mercy an International NGO operating in the Gambia on Thursday 23rd July, 2015 recorded a history in the health sector by donating 911 blankets covering to all the donated hospital beds. The beneficiaries are Edward Francis Small Teaching Hospital (EFSTH) 510 blankets Bwaim Hospital 200 blankets, Serrekunda General Hospital 130 blankets, Sheikh Zaired Regional Eye Care 50 blankets and Farato Health centre 21 blankets. The donated blankets are in red and grey colour. The donation of 510 blanket for 510 beds in the hospital is one of the most rewarding goodwill gesture for the past years that the hospital has received says Mr. Modou Lamin Jammeh, Public Relations Office (PRO) EFSTH in Banjul, while receiving 510 blankets on behalf of the hospital management. He revealed that in the EFS TH, there are 510 beds and the donation of 510 blankets means that all the beds in the hospital will get a blanket saying that the donation is timely. ‘This donation is dream come true because it will reduce our budget expenditure on buying blankets for patients in the Gambia’s main hospital. According to him, Caravan of Mercy has been a true partner with the hospital adding that this is not the first time for the NGO to donate the hospital and was quick to say that the donation of 510 blankets is one of the biggest in the year 2015 done by an NGO in the country. He promised that the donated materials will be put into good use. Mr. Baba Njie Chief Executive Officer (CEO), Serrekunda General Hospital gave thumb-up to Caravan of Mercy saying the donated blankets will be use by in-patients admitted in the hospital during the cool season. He disclosed that Caravan of Mercy has been extending helping hands to the hospital in the past years. Mr. Ansumana Mendy, Hospital Administrator Bwaim Hospital said that on behalf of the hospital management they are happy to receive the donated materials. The donation is going to put smiling faces on the hospital patient’s says Mendy, he assured Caravan of Mercy that the material will be given to right beneficiaries. It could be recalled that Caravan of Mercy donated 100 blankets to Kuntaur Health centre and 500 blankets to Armitage Senior Secondary School. 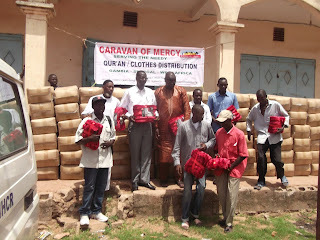 In a similar development, Caravan of Mercy as part of their Ramadan donation, distributed bags of rice, sugar and cooking oil worth four hundred and eighty eight thousand, eight hundred and nineteen dalasis (GMD488, 819.00) to seven rural communities in Upper River Region directly reaching 605 families and some Quranic Memorization Centres in Central River Region and West Coast Region. Caravan of Mercy Overseas Coordinator, Mr. Pa Modou Sillah stated that his NGO is here to support the poor, needy and widows saying that they will continue to help the poor and needy which are their direct beneficiaries and priority.